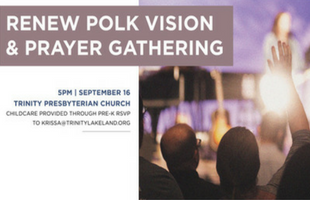 Sunday, September 16, 5-6:30p, gathering of Renew Polk churches and church plants at Trinity Presbyterian Church. We will spend time in worship, prayer and vision-casting about the future of church planting in Polk County. Childcare will be available through pre-k with RSVP to Krissa Valentine.